Another panorama of fun pop music. Let me know if it's fun for you too! As we open Part IV of this in-depth smart-aleck look at The Vengeance of Khan, Kirk has sent the Enterprise limping into the Mutara Nebula, pursued by Khan in the Reliant. Don’t you love how the Mutara Nebula is ringed with speed bumps? You can always excuse this by citing the Enterprise power problems. Enough power for gravity, but not enough power for GOOD gravity. And when Reliant hits the same speed bump, look how insulted Khan is when the poor schmoe behind him accidentally touches his command chair. The “Enemy Below” stalking-each-other scenes are, to me, fun and creepily effective. It’s an old World War I dogfight tactic – hide in the sun, to blind the enemy. And it almost worked! … yet he closes his eyes when Khan bends near, thinking his face is out of camera range. CHEKOV: Could you use another hand, Admiral? KIRK: Of course not. I’d have to get all-new shirts! Parenthetically … while the fans appreciated seeing Chekov on the bridge, how tactically wise it it to hand over your barely-functioning weapons to a guy who can’t walk straight? a guy who until a couple of hours ago was lugging around a space worm in his noggin? a guy who MIGHT HAVE ANOTHER space worm in there? It was nice of Spock to spark Kirk’s tactic by talking about “two-dimensional thinking.” Left unsaid is the observation that, up until now, Kirk had been acting the same way! Certainly I’m not the only person to wonder – if they have all of this bad TV reception, why don’t they just use a periscope? It’s also funny to note that the Reliant is suddenly “tilting” to one side, in space. If you think about it, this makes perfect sense. The side that still has a warp engine is going to be heavier, and ride lower! As the audience is told by David that you can’t stop the music – I mean, the Genesis Wave – Nimoy has a wonderful bit wherein he simply turns a little towards us, as if hearing a faint call. THE CALL OF DESTINY! When I was in grade school in the 1960s, we called this kind of jerky motion “Doing the Spazz.” This sequence is another instance of “Behind the Black.” There are all kinds or crewmembers running around engineering – probably – but nobody thinks it’s a good idea to call up to the bridge and warn them about the rogue Vulcan who’s breaching the radiation protocols. So when “The mains are back on line,” as drama requires for our heroes to triumph, we get a great frisson of relief as we see Enterprise streak away in not one, but three SFX shots. And while it’s a pretty image to show Kirk at the heart of the new Genesis system, the view not correct, dramatically. Carol or David Marcus should have been the center of this dissolve – they’re the ones who done did it. Now comes the time to pay the dramatic piper, and to ring back the statement Spock made to Kirk in the Vulcanian’s quarters yesterday (in film time). The one has paid the price for the many. Now comes the next continuity error. When Kirk steps up to the radiation chamber, the open flap on his jacket changes from one frame to the next as the camera angle changes. These two photos are adjacent frames. A few seconds later, after Spock stands up to approach Kirk, the jacket is open again. But let’s now admire the pathos (corny or not) of this scene. When watched the first few times, remember, Spock was going to stay dead, as far as we knew! Nimoy does a fine job of appearing desiccated, worn out. And Shatner does a fine (almost understated!!!!!) job of resigning himself to his friend’s terrible choice – even though we can see that the effort is tearing him apart. Rescuing the unsaveable ship, indeed! The sight of Shatner’s Kirk trying to match up with Spock’s hand salute reminded me of a phrase from long ago. Thanks to the wonders of the interwebs, I can tell you where the memory comes from! We still have a cult. A few months ago I was walking down a street in Cleveland and a very pretty girl gave me the Vulcan salute. "Yes", I said, "but can you do it with your left hand?" She tried it -- and failed. The she shrugged and said: "Well, I speak it with an accent." You can read the whole interview here. So, Shatner is doing the salute with an accent! The slow pullback from the “bookends” shot is also affecting. The elegy scene is ruined – RUINED – for me – by the stupid, cheesy idea of having a bagpipe play “Amazing Grace.” For me, listening to a bagpipe is right up there with chewing on ground glass. But … I can tell you a little anecdote about Star Trek II, straight from me own memory! 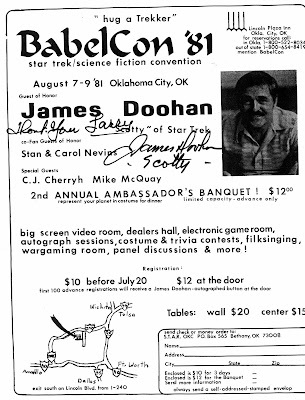 In August of 1981, Jimmy Doohan came here to OKC for BabelCon ’81. In case you didn’t know, this ol’ horn dog liked the ladies. But I can assure you, this is as far as he got with my wife! 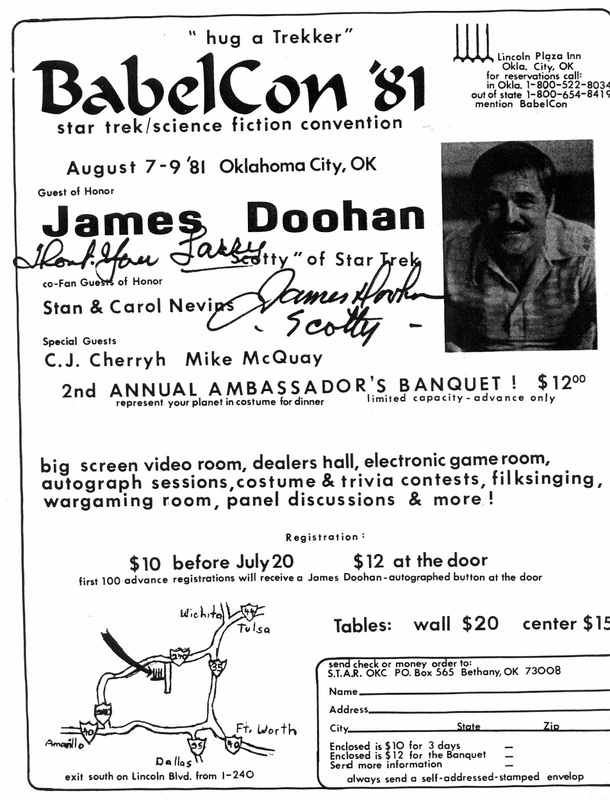 All weekend long, as you can imagine, we twenty-year-olds (and some teenagers) kept hoping that Doohan would drop some kind of hint about the new Star Trek movie that was going to come out next year. But, wise man, he never would say anything. Of course he was doing us all a favor by NOT letting anything about the movie slip. 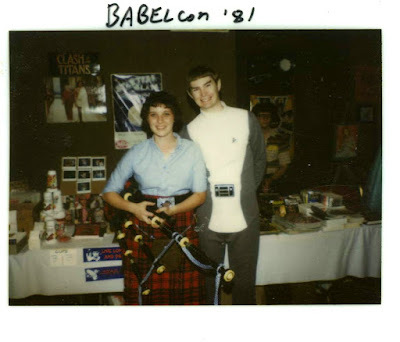 On the Saturday night of BabelCon ’81, there were plenty of room parties. Somehow, Joyce and I ended up at one that included Doohan, CJ Cherryh, and a few more. Another person at the room party was a gal named Sandy. Here she is with me earlier on Saturday, August 8. Note the bagpipe? She could actually play it, a bit. This got Doohan’s attention (and her cute appearance didn’t hurt!). 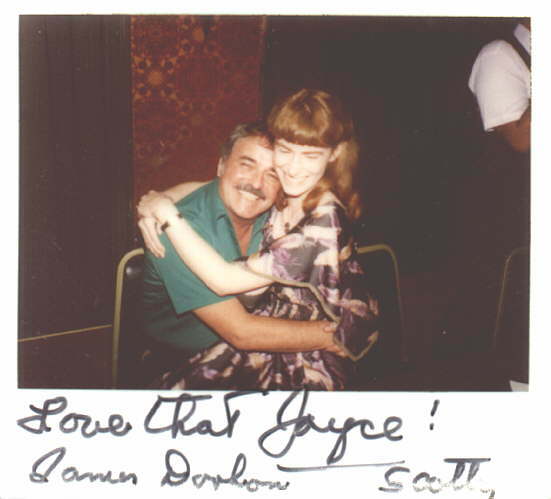 So, anyway, a bunch of us were with Jimmy Doohan at the room party. And Sandy “happened” to have brought along her bagpipe, in its carrying case. And she asked Doohan to autograph it. So he did. Along with his name, he wrote, “A somber tone.” It wasn’t until I watched Star Trek II many months later, and viewed this bagpipe scene, that Doohan’s hint made sense! By a somber bagpipe tone, he was referring to Mr Scott playing at Spock’s memorial. In one of his reminiscences about the making of this film, Nick Meyer tells that one day, a fan asked exactly WHEN Kirk’s glasses got broken. During the ship-rattling dogfight scenes? When he slid down that ladder in engineering to get to Spock? This drove Meyer crazy. His point was that LIFE broke Kirk’s glasses. They were a casualty of the whole story, not a certain scene. Precisely how does David learn that Kirk told Saavik the whole “How we face death is important” speech, which was said in the film’s opening minutes – on the Kobayashi Maru bridge, in case you forgot. Next up is, for me, this film’s “Beauty Shot” of the Enterprise. Ain’t she purty? James Horner’s music is just an extra glimmer on the apple. This brief sequence started the wheels turning in our little fannish minds. Not dead? “Remember” him? Oh, yeah … that mind-meld in engineering – could it have been something more? As Kirk says how young he feels, we pan away towards the Genesis Planet and watch the footage shot by Harve Bennett at San Francisco’s Golden Gate Park, after principal photography had ended. Horner’s music, reedited I guess, has an inspiring lilt as we see the intact photon tube/coffin. For me, the movie would have been better WITHOUT the “Space … the final frontier” voiceover by Nimoy. This was a little TOO heavyhanded. Finally, I read the credits and think how dumb Judson Scott must have felt to see his name NOT in the credits. Because his agent told him the threaten to “waive billing,” remember? 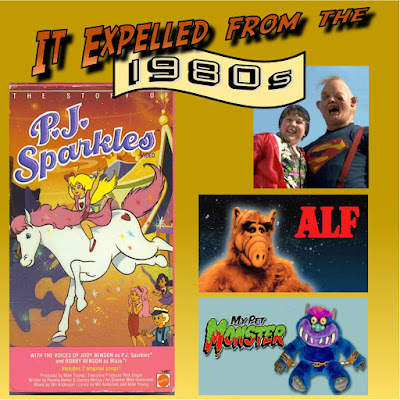 Deep into the end-credits sequence, I have to point out that there are only NINE people credited for “Computer Graphics” – a far cry from all the films we’ve seen the past decade or two, which have hundreds of names listed for things like “cloud effects,” “character texture,” and other very specific assignments. In 1982, baby, it only took nine people to do the “general” computer graphics for a movie! Yes, the next credits are for specific things like starfields. But my point is still valid! And so our intensive, overwrought re-view of Star Trek II sinks slowly into the west. Thanks for joining me (or suffering through it)! See you on Thursday .